Welcome to North Shropshire Beekeepers' Association (NSBKA), which was founded on Friday 23 August 1945. The Association has members spread across the northern part of Shropshire, as well as a few from further afield. We have been a fully affiliated member of the British Beekeepers' Association (BBKA) since our inception. The aims of the association are to encourage and develop the art and science of bee keeping through group meetings, practical out apiary events and educational support programmes in which members can participate and contribute. 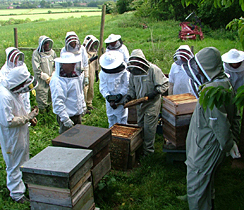 Throughout the winter months (October to March), evening meetings are held where the very best speakers on bee keeping and associated activities are invited to share their specialist skills and knowledge at our monthly meeting, usually held in the convivial atmosphere of a convenient public house, or hotel, or a local village hall. During the spring and summer months we gather at our Association Apiary, or a member's apiary, to perform general hive management tasks, observe and practice bee handling techniques and share our latest bee keeping tales in order that we can all improve our understanding of bees and their behaviour, and maximize our efficacy inpromoting their ongoing health and performance.